The biggest lie in color photography is that you can accurately represent the colors of objects by simply recording the amount of red, green and blue in them. This technique - the only one in current mainstream use - gives good results only when the spectral sensitivity curves of the camera precisely match those of the human eye, and when the spectrum of the light used to make the photo is perfectly smooth, and no different kind of light will ever be used! It's clear that the first of these requirements is hard enough to meet, and that the second one is, simply and plainly, never true. And that's why photographers are always battling to get the right colors - and never do get them! Not only in photography is this matter an important one. In daily life it is, too. Lots of electronic technicians hate that stupid problem of not being able to correctly read resistors. It happens that old-style resistors, and some other parts too, are labelled with color bands or dots, instead of numbers. Under some lighting conditions it can be hard to tell a red from an orange, or a green from a blue. This leads to the wrong resistors being installed in equipment, and thus more troubleshooting work. Housewifes know the same kind of trouble, for example when trying to color-match a button to a shirt. Indoors under the electrical light they find the exact right button, that matches the others, sew it on, and when the dear hubby goes outdoors next day, !BANG!, that button sticks out like a sore thumb! To get a better grip on the problems of light color, I built myself a spectrograph a few days ago. It has been a lot of fun so far, so I'm making this colorful web page, both to bring my results into an orderly shape, and to let other people learn from them. The spectrograph is a simple attachment for my DSLR camera. Using my lathe, I made a two-part piece of plastic tubing, that assembles in an angle of 146.6 degrees. At the junction of the two parts, a diffraction grating is installed. It's an inexpensive foil-type grating that has 1000 lines per mm, which I bought on eBay. Each end of the angled tube screws into the filter thread of a lens. I used 50mm lenses on both sides, but other arrangements are workable too. 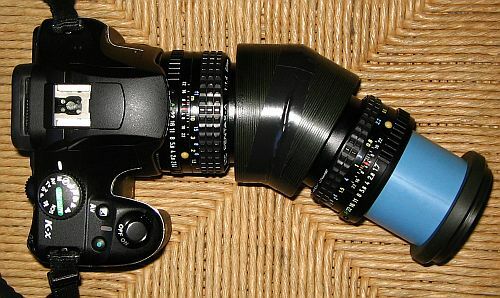 The camera's lens stays focused at infinity, while the additional lens, uses as a collimator, has a narrow slit installed in the center of its focal plane. I made that slit by hot-gluing two pieces of hobby knife blade over a central hole in the cap, on its inside. The blue pipe is simply PVC water pipe, machined on the lathe to press-fit the lense's bayonet, and to have 42mm length. This allows using the lense's focusing ring to bring the slit into the exact position, and thus focus the entire spectrograph. There are several web sites describing the construction of such spectrometers in greater detail. Many of them don't use the second lens, and instead use simply a long tube, placing the slit at a long distance from the diffraction grating, and focusing the camera's lens at that distance. The work being done, let's go and play. Let's start by looking at a full, pretty smooth spectrum of light. It's 1500 pixels wide, so it would be best to set your browser window wide enough. The left border must be roughly at 700nm wavelength, maybe a little lower, while the right one is slightly into the UV range, a little bit shorter than 400nm. I got this spectrum from a blue-tinted "daylight" incandescent bulb. The stage being set, let's look at some single-color LEDs. Here is a red LED dating from roughly 1988. It's pretty far down in the deep red range. It looks very dim to the eye, just enough to use it as an indicator light on a front panel. The following one is a modern, high efficiency red LED. It works much higher in the spectrum. Next in the spectrum comes an old (1988) yellow LED. The spectral range that looks yellow to the eye is pretty narrow, and those old LEDs had a fairly broad bandwidth. It spans from the red over the orange and yellow, well into the green. It looks a dirty yellow to the eye. This instead is a modern "orange" LED. It has a much narrower bandwidth, allowing a more precise color definition. It looks a beautiful golden color to the eye. Then comes an old green LED. As you can see, it's not cleanly green, falling into the lower half of the green range, and a lot into the yellow and orange. It looks green enough to the eye, partly thanks to a green tinted housing! Without that tint, I guess this LED would look rather yellow. Instead a modern green LED has a far narrower bandwidth, and is better settled in the green range. I'm not sure where the Moiré interference in this spectrum came from. I don't think it's an actual ripple in the spectral response. What you can see here is a historical device, straight out of my museum: The very first blue LED I bought! It was very expensive, and gives a very dim glow, but with some goodwill it looks blue indeed! I bought it just to show off with it, in a time when most people still thought that blue LEDs were impossible to make! I understand it's a silicon carbide LED. As you can see, like all old LEDs it's pretty broadbanded, and is centered in the cyan range rather than the blue. This instead is a modern, true blue LED. And what follows is a LED that was sold to me as "ultraviolet". I can't tell how much actual UV output it has, because my camera and my lenses will cut off any higher UV. But it looks promising that I had to lengthen the crop of my spectrum image, to fit the far violet part of the spectrum, which I had cut off before because I though my camera wouldn't see anything there! Note that it also has some faint green and red output. As you can see, there are LEDs for pretty much any part of the visible spectrum. In my collection I don't have any clean, nice, narrowband cyan LED, but it surely exists too! Let's go to actual lamps now. The above LEDs are intended mostly as indicators, having strong colors. Lamps instead are normally designed to produce the whitest possible light, or let me say, a light as close as possible to daylight.This is because the standard for color vision and reproduction is how it looks in nature, under the open sky. This can be either a sunny day, with the proper mix of yellowish sun and blue sky shining down, or a smooth layer of white clouds, which mixes together the light. Of course, clouds do absorb some wavelengths more than others, and so the color of cloud light is _not_ the same as well mixed light of a sunny day. Matters ain't ever simple! The smoothest spectrum comes from blackbody radiators. Plain incandescent glow bulbs are such blackbody radiators - only they aren't hot enough! To produce the holy grail in perfect lighting, we need a blackbody heated to about 5000 kelvin, which is pretty close to 4700 degrees Celsius. The problem is: What material can be used, that survives such temperature while remaining solid? The above is a 25W bulb, while the one below is a 100W one. The spectra of these two are almost identical. Both look very yellow to the eye. As you can see, it has a little bit more blue light than the halogen bulb, making it the smoothest light source in my collection, with the best color rendering and visual impression - but also the least energy-efficient one! For comparison, here is the spectrum of true daylight - the sun, plus blue sky, at mid afternoon, so it should have an average daylight balance. It can be seen that the "daylight" lightbulb, even with its blue glass, is significantly redder than real daylight. The dark stripes in the sun spectrum are the Fraunhofer lines. Now that we have seen the spectrally smoothest light sources, let's see the most "adventurous" ones: Gas discharge lamps! They are essentially pure spectral line radiators. It's no wonder that such lamps just cannot have a very good color rendering, right? Most of the visible spectrum gets no light at all! An object reflecting just narrow ranges of the spectrum might well appear completely black in this light, while it would have bright colors when seen in daylight, or under a glow bulb. And another object that looks red in daylight might look green under a metal halide lamp, simply because it has a strong reflectance in the deep red, like 650-700nm, and a weak one in the center of the green range. Under pure smooth white light, the strong red reflection will dominate over the weak green one, and the object will look bright red, maybe with a slight orange tint. Instead in metal halide light it will look green, because the lamp has no output at all in the deep red range, so that the weak green reflection of the object makes it look perfectly green when lit by the lamp's intense green spectral line! It's a philosophical question whether such incorrect and even unpredictable color rendering is the fault of the lamps, or of any objects, dyes, and pigments that reflect only narrow bandwidths. But my view is that we have far more such objects and dyes and pigments, than we have lamp types, so lamps are easier to control! That's why we should not use any lamps with strong line spectra, whenever we want decent color rendering. There is a special kind of gas discharge lamp, very well known to the photographer: Xenon flash tubes. I made a spectrum of my Pentax AF-280T flash, and once more, I was surprised. Although there are well defined lines, they almost blend into a very smooth, even broadband radiation! For many years, the fluorescent lamp has been the mainstay of lighting. It's efficient, cheap, long lived, and very versatile. Can one ask for more? Sure! One could ask for good color rendering, which fluorescent lamps just don't do. A fluorescent lamp is a long glass tube , either straight or bent in various ways, in which mercury vapor is electrically excited. The mercury emits its characteristic spectrum, and a coating of special materials covering the inside of the tube walls converts some of this radiation into other colors. These special materials are called "phosphors" for purely historical reasons, given that modern "phosphors" don't contain any phosphor (chemical element) at all! These lamps come as straight long tubes, or as bent tubes, to be used with external control circuits (ballasts), or they come as very compactly bent tubes with integrated ballasts, as "compact fluorescent lamps", CFLs, or "energy saving lightbulbs" - even if they are no bulbs but tubes, and they don't save any energy (in absolute terms) but consume it, like any lamp does! Old fluorescent lamps were said (on many websites!) to be "two-color lamps", combining the blue mercury glow with a yellow phosphor. That would produce brutally poor color rendering! Like so many things one can read online, and in books, this is only a half truth. It turns out that this "yellow phosphor" emits a smooth spectrum over a wide bandwidth, spanning from pretty deep in the red, all the way into the cyan and even blue range! The spectrum below, taken from an Oryom 18 watt "warm white" CFL, illustrates this very clearly: The characteristic spectral lines of mercury ride on a very broadband glow centered in the yellow range. Let's compare this to a more modern, "three-color" CFL, having the same "warm white" color temperature of 2700K. This is from an Osram Dulux Star 8W CFL, that claims a color rendering index better than 80%, which is pretty good - and hard to believe! Although the intense blue/violet mercury line is largely absorbed by that lamp's phosphor, there are many broad areas in the spectrum that get essentially no light. This is very far from a smooth, even spectral distribution! quantities of them, so that the red is weaker and the blue is much stronger. I would like to test the spectrum of any fluorescent lamp with >90% color rendering specs, specially the ones rated for color 940, which means 4000K and above 90% color rendering index. Unfortunately there is no place whithin my reach where I can buy any! I have searched all electrical and hardware stores in the wider area, and there are none! But the catalogs of big manufacturers, such as Osram, do list them. I would expect such high-CRI lamps to fill out the dark areas in the spectrum, and further dampen down the bright ones. Perhaps they even extend their range into the deep red! That would mean less efficiency, of course, because the human eye is less sensitive at the extremes. Nothing comes for free in this world. These three seem to use the same kind of phosphor. You could call it "yellow" phosphor, but it's so nicely broadbanded that we could almost call it "white minus blue" phosphor! The exact wavelength of the main blue radiation varies with manufacturer, LED type, and maybe even with the batch. The biggest spectral defect I find with these LEDs is that they have a depression in the cyan range, which is deeper in those LEDs that have their blue output higher up in te spectrum, and narrower. But they all make pretty decent all-color lamps - very much better than CFLs, in any case, let alone metal halide lamps! And the 10mm focused one from eBay. These three are the "warm white" companions to the three eBay LEDs further up. Clearly these three warm white LEDs follow the same pattern as the three cold ones, in terms of shifting the blue center around depending on the exact model, and having a hole in the cyan. And as is logical to get the low color temperature, they have a lot of red output. But wait - the red looks more extended too! Could it be that these warm white LEDs use two phosphors, one being the same wideband yellow the others use, and the second being an extra deep red phosphor? Or maybe they use a wideband red and a wideband green phosphor? I don't know. But they are pretty close to being a full-spectrum source, if it were not for the hole in the cyan range! Now this is a bit hard to understand for me: I see lots of fluorescent lamps advertised to have better than 80% color rendering index, and in catalogs at least I see some rated at better than 90%, while at the same time white LEDs are typically rated at less than 80%. Judging from my spectrograms, instead, LEDs seem to be far better than CFLs in this regard! Is this a case of incorrect hearsay being propagated so much that it has become an established pseudo-truth, or am I missing something important enough to turn around the whole situation? It seems to me that among the light sources shown on this page, some of the white LEDs are the best. Only the blue-tinted incandescent bulb can top the LEDs in terms of spectral smoothness - but there we would be comparing the most efficient to the least efficient light source! Between a modern white LED, and a blue-tinted incandescent, there is roughly a 20:1 ratio in efficiency! With LEDs being among the most efficient lamps in existence, and also among the ones with the smoothest spectral distribution, and apparently being the only lamps that combine both, they are the way to go! Clearly CFLs have very irregular spectra, and metal halide lamps are even worse. My home is currently lit almost exlusively by fluorescent lamps of different types. It seems time now to replace them by LEDs. But not just by any LEDs. It's probably a good idea to buy a few samples of several different types and brands, test them all, and then decide which to buy in quantity for the home.